Complex General Manager Steven Cunningham received the American Hotel & Lodging Association’s (AHLA) Outstanding General Manager of the Year (Large Property) as part of the 2019 Stars of the Industry Awards held in Los Angeles earlier this week. This event recognized top hotel employees in the hospitality and lodging industry for their outstanding accomplishments, service and leadership. Cunningham, a 30-year hospitality veteran, is complex general manager for Hotel Galvez & Spa®, A Wyndham Grand® Hotel, The Tremont House, A Wyndham Grand® Hotel and Harbor House Hotel & Marina at Pier 21 in Galveston. He has served in this role for the past nine years. He is the chairman of the Galveston Hotel & Lodging Association, a Wyndham Hotels representative on the board of the Texas Hotel & Lodging Association and is actively engaged in the Galveston tourism industry. According to the AHLA, his passion for the industry and compassion for his staff is what sets him apart. After Hurricane Harvey impacted the area, Cunningham provided displaced employees and their families with housing, meals and resources at the hotel along with gift cards to help. Under his leadership, both Hotel Galvez and The Tremont House have been recognized as “Best of Wyndham Grand” properties. In 2012, he received Wyndham’s General Manager of the Year Award and in 2010, Hotel Galvez was named Wyndham Hotels’ Hotel of the Year. “I was both surprised and honored by this award,” says Cunningham. “It is such a privilege to be recognized alongside the other AHLA award winners”. Hotel Galvez & Spa®, A Wyndham Grand® Hotel, is the only historic beachfront hotel on the Texas Gulf Coast. This 224-room, century-old hotel offers 13,000 square feet of meeting space, a 9,763-square-foot spa, fitness center, full-service restaurant, lobby bar, pool with a swim-up bar and Hall of History. The hotel is rated four diamonds by AAA and is owned by the Cynthia and George Mitchell family as part of Mitchell Historic Properties. For reservations, call (409) 765-7721, or visit www.HotelGalvez.com. Travel is the best excuse to enjoy the grand things in life. With locations in some of the world’s most sought after vacation destinations - including Shanghai, Istanbul, Doha, Salzburg and Orlando - Wyndham Grand® hotels transform ordinary moments into unforgettable experiences. Decidedly not stuffy, but approachable by design, this upper-upscale hotel brand helps travelers make every moment count. Follow @WyndhamGrand on Facebook and Instagram. Galveston’s Hotel Galvez General Manager Steven Cunningham was recognized by the American Hotel & Lodging Association’s as Outstanding General Manager of the Year (Large Property). 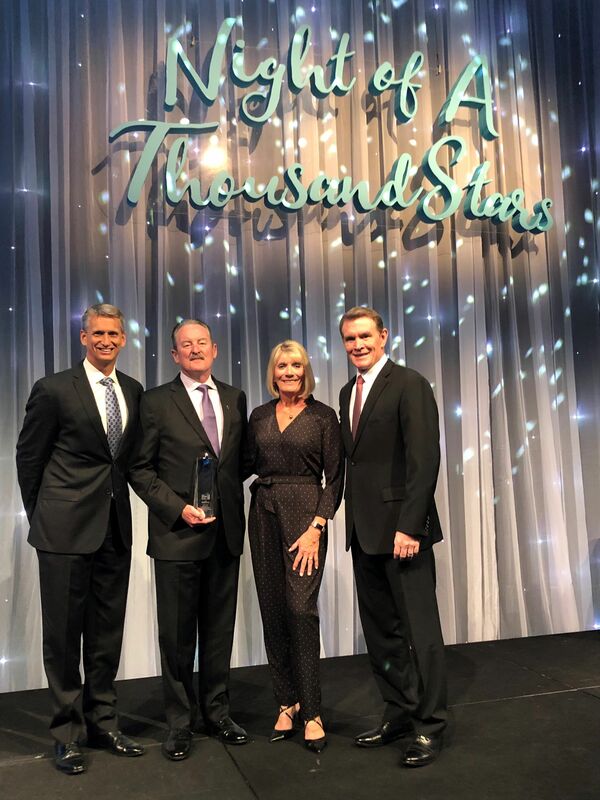 Pictured, from left, are Regional Vice President Wyndham Hotels and Resorts Jurgen Schafers, Cunningham, Mrs. Rebecca Cunningham, and President of Wyndham Managed Hotels Mark Kukulski.